A serious car accident leaves Anjelica with a badly broken nose (that has to be rebuilt with plastic surgery) and puts her, as she approaches age thirty, on a path to finding an independent identity. "After I broke my nose, something changed in me -- I made up my mind to take greater advantage of my life," she writes. She takes acting lessons with Method acting coach Peggy Feury and lands some small roles, including bits in This is Spinal Tap and the TV sitcom Laverne and Shirley. Within a few short years she wins a best supporting actress Oscar for a scene stealing turn in Prizzi's Honor, a black comedy starring Nicholson and directed by the elderly John Huston who was slowing dying from emphysema. Anjelica points out that producer John Foreman, who she considers a mentor of sorts, hired her first. Her illustrious dad and big-name boyfriend signed on only after she was already involved. The Oscar earns Anjelica increased respect as an actress and raises her profile but did not send her to the top rank of Hollywood stars. Still, she works regularly in major productions and has carved out a career that is her own. She is often part of ensemble casts as in Francis Ford Coppola's Gardens of Stone, the television mini-series Lonesome Dove, and the Wes Anderson films -- The Royal Tenenbaums, The Life Aquatic with Steve Zissou and The Darjeeling Limited. Occasionally there are lead roles. Anjelica calls the part of Lilly Dillon, a cold-hearted conwoman in The Grifters (1990) "arguably the best role of my life" and admits that director Stephen Frears contacted her only after the part had been turned down by Melanie Griffith (who was a big star back in the 1980s, it should be remembered). About another plum role -- Morticia in Barry Sonnenfeld's The Addams Family and Addams Family Values -- Anjelica wryly wonders why the producers wanted her and not Cher. Anjelica in Prizzi's Honor, 1985. As Anjelica moves toward middle age her independence grows stronger. Her father dies. Her relationship with Nicholson, which had been withering away for some time, in part due to Jack's increasingly flagrant womanizing, finally ends when he fathers a child with young actress Rebecca Broussard. "Although in many ways in was not logical, the sense of betrayal was overwhelming; I felt abandoned and dejected and humiliated...I was very lonely at this period of my life. But I realized that it had been Jack's life, for the most part; I had existed in in it. That was over now," Anjelica writes. She coolly adds that Nicholson and Broussard's second child, a boy, is "named Raymond. Which is odd, since we'd once owned a dog by that name." 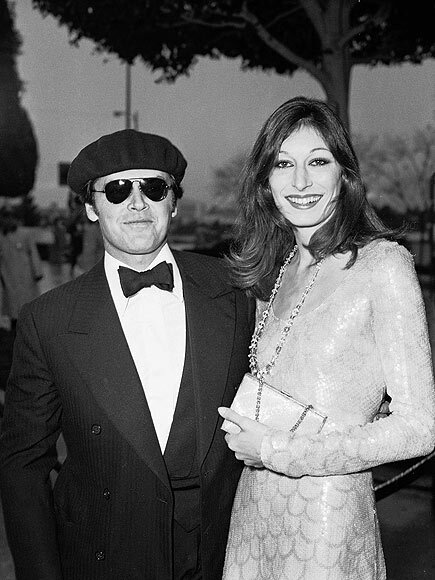 Though their almost two decade long romance ended badly, Anjelica makes it clear that she remains fond of Nicholson who she calls "a fair and true friend." 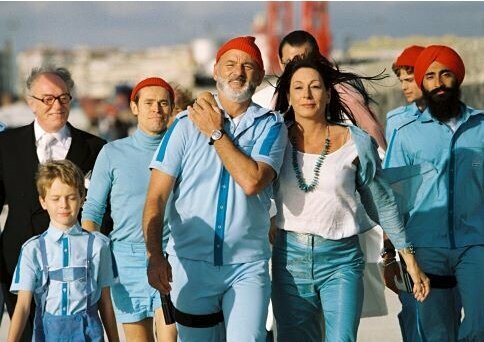 The Life Aquatic with Steve Zissou, 2004. 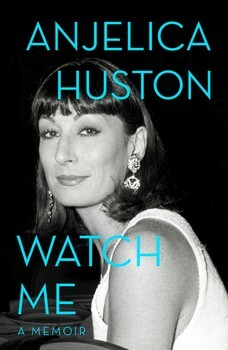 Thrown into the brisk narrative of Watch Me are Anjelica's impressions of some of her famous co-workers. Bill Murray is cordial during the making of The Royal Tenenbaums but is inexplicably frosty a few years later on The Life Aquatic with Steve Zissou and doesn't ask her to a dinner he hosts for the cast. Woody Allen, who hires Anjelica for Crimes and Misdemeanors without ever having met her, rebuffs her suggestion that they get together for a get-acquainted drink before starting work on the movie. "Was it boredom or anxiety?" Anjelica wonders about Allen's anti-social reaction. Visiting Jack on the set of Ironweed, Anjelica finds Nicholson in his trailer with his co-star Meryl Streep. "They were speaking in the lingo of their characters, alcoholic lovers. There was no doubt they were very comfortable in each other's presence, because neither one broke character to greet me," Anjelica recalls. 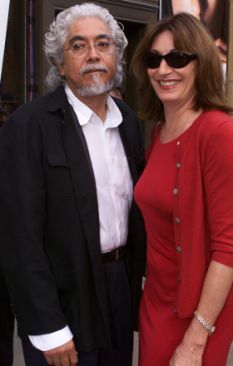 In the relatively long discussion of Prizzi's Honor, Anjelica is conspicuously terse in regard to Kathleen Turner, the film's leading lady, who is mentioned only in passing. In 1992, a couple of years after ending things with Jack, Anjelica marries for the first and so far only time in her life. The groom is Mexican-born sculptor Robert Graham. Like Nicholson and John Huston, Graham is an older man with a strong personality and a successful career that he puts above all else. Unlike Jack and John, however, Graham is something of a brooding loner. Anjelica and Graham build a fortress-like house for themselves in Venice Beach. The marriage has its difficulties (he goes for long periods without speaking; she has an affair while making Ever After in the South of France) but endures until Graham's painful death from a rare illness in 2008. Anjelica's life as presented in Watch Me lacks the usual components of a Hollywood memoir. No difficult climb out of obscurity. She is a Huston, after all. No divorces. Though she says she sometimes pressed Nicholson to legalize their relationship, they both seem to have been too self-aware to ever have thought that things would really be till death do us part. Drug use and drinking are alluded to but don't turn problematic. 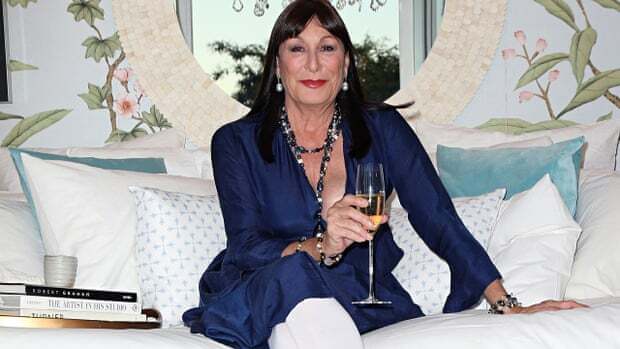 Anjelica even manages to permanently overcome a forty-year long heavy smoking habit with a day-long seminar at a hotel conference room in 2006. "I haven't had a cigarette since, and have had no desire to smoke," she tells us. Whether this is true or not, it's not dramatic. Watch Me has many moments of interest but lacks the charm of Anjelica's briefer and more engaging earlier memoir, A Story Lately Told, which recounts her strange, isolated upbringing on a rural Irish estate, then her busy adolescence in Swinging Sixties London. The first book, though written with the same cool detachment of Watch Me, offers up a child's eye view of the larger than life John Huston's extraordinary home life replete with children legitimate and not, foxhunts, functional alcoholism, unpaid bills, famous authors including John Steinbeck and Carson McCullers coming to visit, and ex-wives turning up. There is also the tragedy of Anjelica's mother's death in a car accident. Frankly speaking, I've never heard about Anjelica Hustonbefor. So I'm very grateful to you for sharing the post. By the way, I work in Edu Birdie, If you need help with your studies, you just come to talk to me. Functionality is important when it comes to your home, but you must not compromise its look. A fabric bed frame is an option for your bedroom, but you have to find the orthopedic mattress to go with it.